The education reform debate as we have known it for a generation is creaking to a halt. No new way of thinking has emerged to displace those that have preoccupied reformers for a quarter century, but the defining ideas of our current wave of reform (standards, testing, and choice), and the conceptual framework built around them, are clearly outliving their usefulness. Those ideas are not misguided. Rather, they are just not powerful enough to force the rusty infrastructure of American primary and secondary education to undergo meaningful change. They have failed at bringing about the reformers’ most important goal: dramatically improved student achievement. The next wave of education policy will therefore need to direct itself toward even more fundamental questions, challenging long-held assumptions about how education is managed, funded, designed, and overseen. The exact shape of this next generation of education policy is still far from clear. It is not too soon, however, to think about how we have arrived at this point and to draw lessons from what has and has not worked. Much of the problem, they concluded, stemmed from America’s disregard for measurable educational outcomes. And although the teachers’ unions and other staunch defenders of the status quo have resisted that assertion, most reformers (on both the left and the right) have since come to accept the idea that academic performance—as measured by achievement tests, completion rates, and international comparisons, rather than by spending, intentions, or equity of access—should be the principal benchmark for assessing the success or failure of American schools. In this view, the overriding mission of reform is to boost academic achievement in primary and secondary schools. Two further goals are related but subordinate: to narrow the learning gaps between haves and have-nots and to help disadvantaged children escape dreadful inner-city schools through the creation of better alternatives. This three-pronged mission has given most education change agents their purpose for twenty-five years. This is not to say, of course, that there is unanimity about the best means of achieving these goals. Some reformers (especially but not exclusively on the right) have focused on the need for alternative schools to break the stranglehold of the education establishment. Their emphasis on competition has fostered the booming marketplace of school choice. It has yielded thousands of charter schools (and a growing battalion of for-profit and nonprofit charter management organizations), vouchers in a few places, tax credits in a few others, and scads of additional options—from homeschooling and virtual schooling to magnet schools, statewide public school choice, and International Baccalaureate programs. Other reformers (more often on the left and in the center) have focused on the need to improve the existing public school system through testing. This emphasis has yielded statewide academic standards and evaluation methods, as well as considerable federal aid and pressure. The expanded federal role has been most evident in a thoroughly revamped National Assessment of Educational Progress (1988); the Clinton administration’s Goals 2000 Act (1994); the Bush administration’s No Child Left Behind Act (2001); and, most recently, the Race to the Top component of the 2009 economic stimulus act, which will award competitive grants to states that, in the judgment of the Obama administration, have what it takes to turn around failing schools and boost student achievement. These results-oriented reforms have been accompanied by much activity: vastly improved collection of achievement data, report cards on school performance, new ways of thinking about financing education, innovative organizations such as the New Schools Venture Fund and Teach for America, unconventional leadership in schools and districts, and a plethora of alternative pathways into the classroom that allow would-be teachers and administrators to avoid the traditional college-of-education miasma. Yet even as these divergent emphases and priorities have defined the contours of the education reform debate, its core has, by and large, consisted of widely shared aims. And certain elements of that reform consensus, and the changes it spawned, have become anchored in the American educational mainstream. The central goal of boosting achievement, for example, is now well established—superimposed atop yesterday’s preoccupations with equity, disabled youngsters, and progressive pedagogies. We now judge schools first and foremost in terms of pupil achievement. We expect far greater transparency about student, school, district, and state performance, and we want that transparency to extend to pupil subgroups, not just overall averages. We no longer take it for granted that kids will attend the district-operated public schools in their neighborhoods and that the only exceptions might be wealthy families and Roman Catholics. We no longer assume that superintendents must be career-long education professionals or that school governance belongs exclusively to elected local boards. We no longer even assume that face-to-face contact with a teacher inside a building called a “school” is the only possible circumstance in which instruction and learning can fruitfully occur. These profound changes have gained real traction in America’s psyche, laws, and classrooms. They have done much good, and we should strengthen and build on them. But the reform consensus that produced these valuable developments now seems to be fraying at the edges, if not actually unraveling. Perhaps the most visible example of this deterioration is the widespread anger among both education professionals and policy makers over the design and implementation of the No Child Left Behind Act (NCLB). No sane observer expects to see the kind of “universal proficiency” that this statute demands by 2014. Nobody thinks it makes sense to brand tens of thousands of schools as failures when many of them are successfully educating nearly all their pupils. Few believe it smart to set a single proficiency bar and focus only on students just below it, at the expense of both those far below it and those already above it. On the left, many insist that NCLB is “underfunded”; on the right many bridle at its heavy-handedness and its seeming inability to foster more choices among schools. Yet much of this backlash appears to be a kind of projection: NCLB stands in for the broader education reform consensus, which increasingly finds itself lacking advocates and defenders. The bipartisan agreement woven together in 2001 by President Bush and members of Congress from both parties (including, notably, the late senator Edward Kennedy) has long since fallen apart; what remains of its approach is now thoroughly unpopular with the education establishment. The National Education Association, though a longtime Democratic sidecar, recently issued a denunciation of Education Secretary Arne Duncan’s Race to the Top funding criteria—alleging that they place far too much emphasis on charter schools and insult teachers by suggesting that their performance should be gauged by their pupils’ achievement. The NEA, like many other education organizations and interest groups, wants Washington to revert to its earlier role as funder rather than reformer of American schools. NCLB is now conventionally described as a “tainted brand,” and there is even some loose talk of “repealing” it. Such talk reveals a failure to understand that this law is just part of a far broader approach to federal education policy—merely the most recent reauthorization of President Lyndon Johnson’s 1965 Elementary and Secondary Education Act—and therefore remains the principal vehicle for channeling federal aid into K–12 education. The real argument surrounding NCLB is not about whether those long-standing funding channels should be preserved; of course they will be. The debate is about which strings should be tied to those federal dollars and toward which reforms the funding should be aimed. The dispute boils down to whether Uncle Sam’s proper role in K–12 education is to provide resources, demand changes, or simply get out of the way of states, districts, and parents. This divide is unlikely to be bridged any time soon. As No Child Left Behind inflames passions among professional education reformers, it also highlights a broader backlash against testing across much of the American middle class. It’s not that parents and voters have turned against the principle of using standardized tests to monitor school and student performance; national surveys continue to show overwhelming (two to one) support for the practice. The problem stems from parents’ concern that their own children might be denied promotion or graduation based on a test score; from voters’ confusion when their own upscale suburban schools are deemed to be failing by state or federal accountability systems even though most of the graduates do just fine; and from frustration when parents—often prompted by teachers—conclude that the basic-skills testing regime yields too much “drill and kill,” too little flexibility, and insufficient attention to art, music, and other creative disciplines. There is no reason to expect an end to standards-based performance monitoring and evaluation. It is clear, however, that testing—particularly the high-stakes use of test results to reward or penalize students and teachers—has few friends outside the ranks of professional education reformers. For similar reasons, the idea of national educational standards—the natural companion to national testing—also finds itself under suspicion. Although it is true that a system of uniform academic expectations and assessments would rectify some shortcomings of state-specific standards (each state has an incentive to lower the standard so that it “passes” as many schools as possible), it represents a venture into uncharted territory, and it is far from clear that many states will take the plunge. National standards also risk unleashing negative forces in American education—including further curricular narrowing, harmful effects on states that got standards right in the first place, and the possible rekindling of culture wars over what knowledge and which skills matter most (and who gets to decide). Similar endeavors in the 1990s went badly awry and poisoned many people’s views of national standards and tests. Moreover, almost nobody wants the federal government itself to run such an enterprise. The dispute over No Child Left Behind boils down to whether Uncle Sam’s proper role in K–12 education is to provide resources, demand changes, or simply get out of the way of states, districts, and parents. If standards and testing formed one arm of yesterday’s education reform consensus, a push for new alternatives to traditional schools formed the other. But the reform ideas generally labeled “school choice” have lost some credibility, owing to the mediocrity of the actual schools they have produced. Far too many of these institutions deliver weak academic results or fall victim to organizational, political, and financial woes and shenanigans. Advocates of such alternatives have learned, to our sorrow, that although putting a “charter” sign on a schoolhouse door certainly indicates potential, it is no guarantee of quality or innovation. Nor are all charters created equal. (Our ability even to evaluate charters varies greatly, too, depending on who performs the evaluations, what methods they use, and which schools they examine.) A few jurisdictions are sparing in their issuance of charter contracts; theirs show impressive performance. Other states confer charters on nearly everyone who applies; in those states schools have multiplied, along with wide discrepancies in quality and performance (tending, however, toward the mediocre). One can make a powerful case that many of these new schools have not been given a fair chance to succeed. Policy makers have kept them overregulated and underfunded, lacking in facilities, and subject to far too many bureaucratic hassles. Yet the resulting mediocrity—regardless of fault—only aids foes of charters and choice who argue that this approach must be contained, if not repealed. Recent years have also brought principled critiques by influential scholars—E. D. Hirsch, Grover Whitehurst, and Diane Ravitch come immediately to mind—of both standards-based reform and school choice, on the grounds that these changes neglect crucial issues of curriculum and instruction (and so neglect what actually goes on in classrooms between teachers and students). 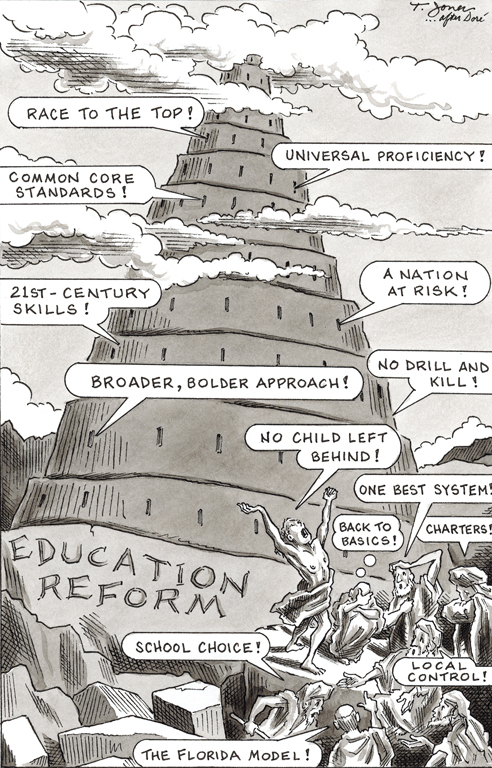 These education experts have forsaken the reform consensus; they now argue instead for an improved version of the “one best system” of American public schools—harking back to the Horace Mann–era conviction that a single, uniform public education system, run by professional educators, is the surest path to both literacy and civic unity. Such critics have been increasingly successful in convincing other reformers and policy makers. Their case is surely strengthened by three dismaying trends. Despite all the activity and energy surrounding education reform in recent decades, American test scores have remained essentially flat, as have graduation rates and our international rankings. National assessment (NAEP) scores have barely changed over the past thirty years. Recent SAT scores have shown tiny gains in math, offset by declines in verbal performance. The two major international testing systems invariably find American students in the middle of the pack in math, science, and literacy, with scores generally lowest in the upper grades. In other words, twenty-five years of outcomes-minded reforms have yielded little or nothing by way of genuinely improved educational outcomes. And while the United States has been treading water, a number of European and Asian nations have strengthened their performances, not only in test scores but also in matriculation rates. It is hardly surprising that the apparent exhaustion of the education reform consensus coincides with an exhaustion on the part of the American public, not to mention many policy elites and politicians. It is no coincidence that 2008 saw the first presidential election in two decades in which K–12 education reform did not loom large. People seem weary of it, tired of unkept promises, fatigued by a seemingly endless parade of plans, schemes, initiatives, and pledges that fail to solve the most basic problems. Savvy politicians have taken note. Advocates of alternative schools have learned, to their sorrow, that while putting a “charter” sign on a schoolhouse door certainly indicates potential, it is no guarantee of quality or innovation. These developments have created an opportunity for the defenders of the status quo. Large parts of the education system itself—the unions, the faculties of schools of education, school board associations, and the like—never quite bought into the reform consensus and continue to do their best to subvert it. They see both school choice and standards-based reforms as inimical to their interests, offensive to their philosophy of education, and insulting to their professionalism. As long as there was a reasonably robust bipartisan consensus backing serious education reform, they could not do much to halt its advance. But the public school establishment is limitless in its capacity to exploit every fissure in the reform movement. Its goal is to re-empower itself, to expel the infidels who have invaded its temple—all those governors, legislators, mayors, business leaders, and policy wonks—and to restore something of the tranquillity and hegemony it enjoyed before the early 1980s. No clear alternative to the old consensus has emerged. Some individual reformers and critics know what they want, of course. E. D. Hirsch calls for a national K–8 curriculum aimed at forging culturally literate Americans. Charter critics want tighter regulation of all “schools of choice.” Some Republicans want greater freedom for states and parents; some Democrats want less. Secretary Duncan wants to transform the lowest-performing 5 percent of schools. A number of people obsessively seek to promote “twenty-first-century skills.” The Bill and Melinda Gates Foundation wants more people to go to college. McKinsey & Company wants the United States to be more like Singapore. There is simply no shared view of ends or means. Instead, fault lines run in many directions. One such schism is plainly visible within Democratic ranks. There, one finds “Democrats for Education Reform” on one side calling for more charter schools, merit pay, and results-based accountability for educators, and teachers’ unions on the other side, defending the status quo. Also noteworthy is the near-simultaneous emergence on the center-left of two separate reform alliances: the Education Equality Project, which argues that current schools can produce stronger results, and the Broader, Bolder Approach to Education, which contends that bigger societal changes must precede any major gains in school effectiveness. A schism can also be seen, somewhat less vividly, among Republicans. Newt Gingrich, for example, aligns himself with New York City Schools’ chancellor Joel Klein, preacher Al Sharpton, and the “Education Equality” faction focused on narrowing achievement gaps. Meanwhile, South Carolina Senator Jim DeMint, Michigan congressman Pete Hoekstra, and Representative John Kline of Minnesota want the federal government to take a more hands-off approach. And governor-turned-education-reformer Jeb Bush wants the entire country to emulate Florida’s model of charters, vouchers, standards, school-based accountability, better data, and a limited form of merit pay. This means not only fighting to loosen the stranglehold of the teachers’ unions, as many reformers have tried to do for years, but also rethinking some of the premises and timeworn organizational arrangements of the education system. For instance, it seems increasingly clear that our revered system of “local control” by elected municipal school boards cannot cope with today’s realities of metropolitanization, mobility, and interest-group politics. And familiar modes of financing local schools based on dramatically varying property values and income levels yield results that are neither equitable nor efficient. Meanwhile, the “one best system” of public education—for all its appeal to Hirsch, Ravitch, and others—fails to accommodate diverse cultural, economic, and familial demands. Our traditional approaches to preparing, licensing, deploying, and compensating educators are ill-suited to contemporary career paths, lifestyles, and management practices. Traditional means of delivering instruction fail to make good use of today’s technologies. And our layered policy structure of local, state, and national responsibility for schools has proven better at blocking change than advancing it. One can fairly view No Child Left Behind and Race to the Top as the latest and most forceful efforts to make the old structure work better—by creating in Washington incentives to prod state and local education systems to change specific practices and deliver better and more uniform results. NCLB tightened the screws; wielding stimulus dollars, clear priorities, and new regulations, Duncan is tightening them further still. But the old system is obsolete, and forty years of sad experience show that further tugging and prodding from the banks of the Potomac are not going to modernize it. More than details of individual reform proposals, we need an overarching vision of the kind of system we want. The next wave of education reform will require both the right and the left to let go of some long-held premises about education policy. Conservatives will need to see, for instance, that local control and funding are no panacea; that the difference between more private school choice and more public school flexibility, accountability, and variety is not as great as it might seem; and that national standards and tests—for all their flaws and risks—may be essential to meaningful improvement in student performance. The left, meanwhile, will need to see that the dream of a single best public school system, with the teaching profession largely held apart from the usual standards and practices of professional life, simply will not work in twenty-first-century America. On the contrary, the model of self-governing schools—whether private or public—with significant control over their own operations, staffing, curricula, and budgets is far more likely to serve the ends of performance-based reform. A renewed commitment to the goals, rather than the particular means pursued during the past several decades of reform efforts, may help both liberals and conservatives see their way to bold, constructive ideas for improving American schools and toward alternatives to schools as we know them. It will not be easy for any of the players to admit that it is time to pursue a new approach. But only by returning to basics can we hope to achieve what must always remain the essential goals of education policy: to provide all children with the knowledge they must have to be informed American citizens, and to give them the skills they need to compete in tomorrow’s global economy. A fuller version of this essay appeared in the winter 2010 issue of National Affairs (www.nationalaffairs. com). New from the Hoover Press is Reroute the Preschool Juggernaut, by Chester E. Finn Jr. To order, call 800.935.2882 or visit www.hooverpress.org.